The institutional review board of SRM Dental College, Ramapuram, Chennai operates to ensure the protection of the rights and welfare of human participants in biomedical, experimental and behavioral research conducted at SRMDC. The SRMDC-IRB reviews all types of research proposals involving human participantswith a view to safeguard the dignity, rights, safety and well being of all actual and potentialresearch participants before approving the research proposals. The goals of research, howeverimportant, should never be permitted to override the health and well being of the researchsubjects.The SRMDC-IRB will ascertain whether all the cardinal principles of research ethics viz., Autonomy, Beneficence, Non – maleficence, Respect for Free and Informed Consent, Respect for Human Dignity, Respect for Vulnerable Persons , Respect for Privacy and Confidentiality and Justice are taken care of in planning, conducting and reporting of the proposed research. For this purpose, it will look into the aspects of protocol review, selection of participants, voluntary participation of potential participants, informed consent process, risk benefit ratio, distribution of burden and benefit, maintenance of privacy and confidentiality and provisions for appropriate compensations. It will review the proposals before the commencement of the study as well as review periodically until the completion of the study through appropriate well documented procedures. Such a review may be based on the periodic study progress reports furnished by the investigators and/or monitoring and internal audit reports furnished by the Sponsor and/or by visiting the study sites. 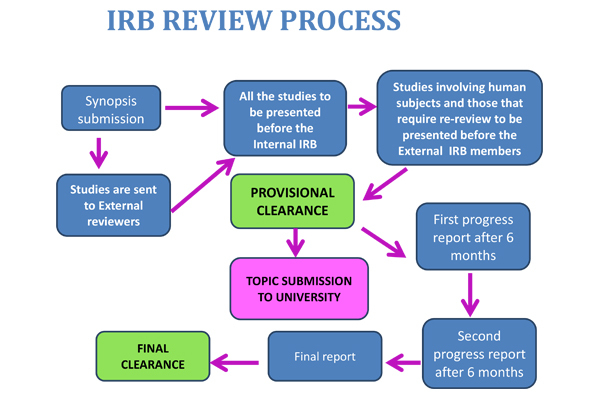 The mandate of the IRB shall be to review all research projects to be conducted at the Institutioninvolving human beings directly or indirectly, irrespective of the funding agency.SRMDC IRB will provide advice to the researchers on all aspects of the welfare and safety of the research participants after ensuring the scientific soundness of the proposed research. SRMDC-IRBis a multidisciplinary and multisectorial body in composition andindependent. The board constitutes of external and internal members from medical / non-medical, legal,scientific and non-scientific persons. Karpaga Vinayaga Institute of Medical Sciences.